Follow the wiring instructions as volts gauge HERE if you only have one unit of gauge. 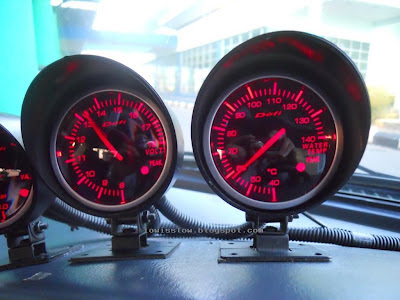 But if you have installed Defi BF gauge previously, you just need to use the link power cable (refer picture below) provided in the package and plug it into the first gauge and another end to the 2nd gauge. There's no need to do another wiring for power supply for second, third, fourth and so on. ﻿ I think there should be no problem with the gauge mounting process, very simple. Just take a look for a few seconds, and then you know what to do. So we proceed to the next step, searching for a hole at the engine bay firewall to give way to the sensor wire because water temperature sensor will be mounted at the coolant radiator hose. Next, drain the coolant by removing the draining screw (it looks like a Mickey Mouse ear) that located somewhere at the bottom of the radiator. Refer picture below, circled in red. Cut the upper coolant hose to the radiator, and　connect the water temperature sensor hose adapter into the hose that has been cut. Clamp it tight on left and right with the clamps that come with the adapter. 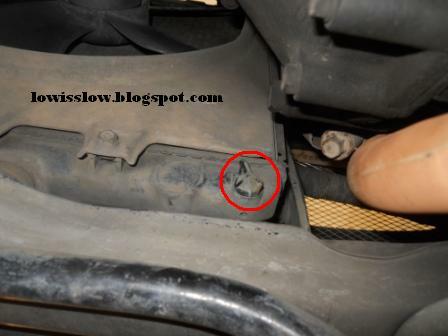 Then wrap the water temp sensor threads with 2/3 rounds Teflon tape to avoid the coolant leaking. 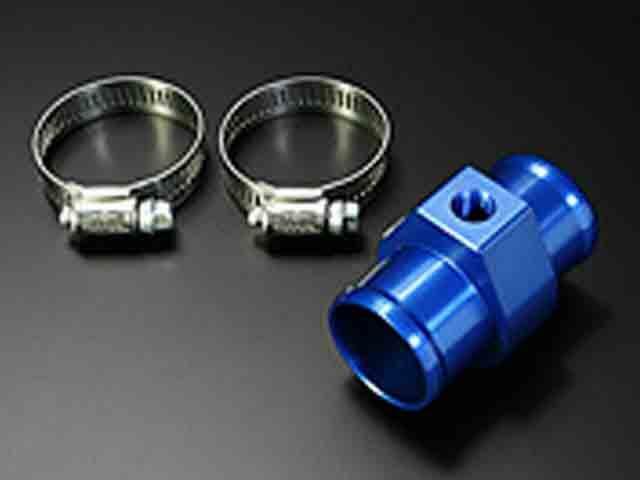 Use wrench no.12 to tighten the sensor to the adapter. Please take note here that if the sensor only have one wire ( picture 5 above), you need to make grounding wire on it by connecting a wire to the small screw just next to the sensor's hole, and another end to the vehicle body. 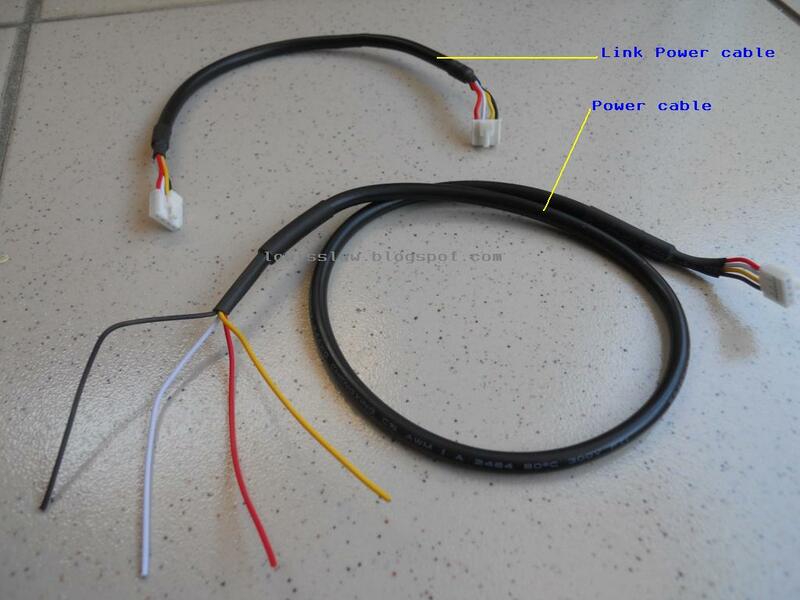 If the sensor comes with two wires (picture 6 below) as my new gauge sensor, there's no need to make grounding. For the sensor wiring, white wire of the sensor connect to the red wire to the gauge, black wire of the sensor connect to　black wire to the gauge. Done with that, refill the coolant and check for any leaking. Start the engine for a few minutes before you add some more water into the radiator. It should be work better. Normal operating temperature is around 85-95 degree Celsius. As for my Perodua Kancil and Perodua Viva I just installed recently, the radiator fan will be automatically ON when the temperature reached 94 degree Celsius. Done!! This is an explanation about the two pictures above; picture no5 & 6. 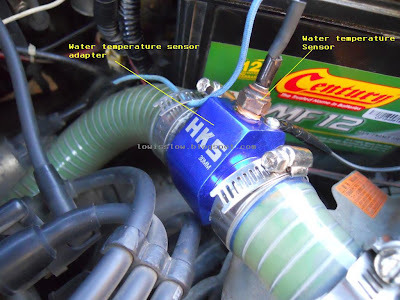 Tips for Perodua Kancil user or any carburetor engine vehicle, you can use the existing coolant temp sensor location. For Perodua Kancil, the coolant temperature sensor for stock in-dash water temp gauge located at the engine head, front side and next to the thermostat housing, it is single wired sensor (refer picture 6, but in this picture, i have changed single wired sensor to a new temp gauge 2-wired sensor). For a better and accurate reading of the water temp, it is recommended to install it there, before the thermostat. So that's why I decide to replace the stock water temp gauge sensor with my new water temp gauge sensor there (2-wired). Because the sensor reading before thermostat is an actual coolant temperature in the engine blocks. I mean current coolant temperature. Just in case if the thermostat fail to open the valve to allow hot coolant flow to the radiator, we can spot it early as the temperature keep rising. But if you install the water temperature sensor to upper coolant hose to radiator, the reading will only be taken just after the thermostat open its valve and hot water flow through the sensor. 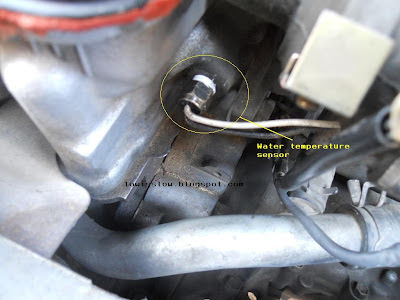 During the thermostat closed, the sensor only read water temperature in the upper radiator hose itself, not the coolant temperature in the engine block. What happen if the thermostat fail to open the valve, the temperature reading on your gauge will shows normal temperature or slightly low, even though the coolant temperature in the engine block nearly blown your car engine. But in normal situation, when the engine warm enough, the temperature between before and after thermostat not much different because the valve thermostat slightly open that allow coolant flows to the radiator. Stock water temp gauge sensor I installed it to the adapter, easy to say by swapping the sensor location. If you doing this and you don't want to reuse the stock water temp sensor, it is okey, but the in-dash water temperature gauge will not work. Nothing to worry because you now have a great water temp gauge. But two is better than one am I right? That why I decide to reuse and connect the stock water temp sensor to the adapter. But, for the electronic fuel injection engine (EFI), this is not recommended. Worried that it will affect the fuel consumptions because existing water temp sensor connect directly to the engine control unit (ECU) that control air-fuel mix. One of my friend get his Proton Wira's thermostat housing drilled to located the external water temp sensor, and he get the actual water temperature reading inside the engine block. Just make sure to drill it before the thermostat valve from engine. You can try it, but I WILL NOT RESPONSIBLE　for any loss or damages to your vehicle. Sorry typing error, Picture 8 refer to picture 6. thanks for your concern. hi there. do we need to setting the gauge? or how to reset the gauge? Always had a trouble to fix water thermostat in my vehicle. Thanks for the review of Stable writers I found you blog and it made my life a driver easier. Your posts are great. I hope that more people will start reading your blog. Programmable SMS is expanding with thousands of Cloud and software based organizations now effectively using it to execute KYC (Know your customer) as well as send OTPs, alerts and digital receipts. This has led to not only improved productivity but better customer relationships.